We wrote about the Green Wave for bicycles back in January. The term 'Green Wave' applies to any road where signals are synchronized for traffic to flow during the green phase at a set speed. 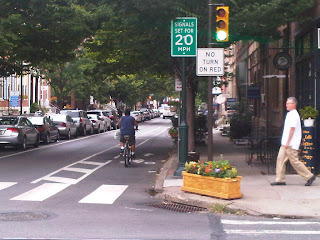 Last week the City unveiled its first Green Wave signs, posted on Spruce and Pine Streets for 20 mph (the lights are actually timed for vehicles travelling 22 mph; why the round down to 20 is unclear). These Green Waves run from Front St to Broad St. Cycling at 20 mph can be a bit much for some cyclists; riding Spruce this morning I caught the green lights from 4th to 9th before hitting a red. Still, the message to motorists is clear: that going slower will make their trip smoother, mitigating their biggest annoyance - delay. Green Waves keep traffic moving by giving cyclists and motorists a system for minimizing delay along their own rides. Of course, it takes some of the fun out of figuring out your own system for timing lights, but we are happy to see Philadelphia giving them a try. I've noticed the lights being timed well from about 20th to Broad since lat year. It seemed like the lights prior to 20th were not in the wave. 20MPH is a little high, but considering that the light cycle is probably > 30 seconds, you could go about a mile if you start with a green. Also the Broad Street light is most likely not in the wave because the red cycle is probably greater than that of the other streets. But my real question is, does anyone know why the lights on Spruce/South Street Bridge have been taken out of the wave pattern in the last two weeks? Previously, you could catch the green as a cyclist at 34th and have greens all the way to 22nd and South, but recently the pattern has changed so neither cyclists or motorists can catch a wave. Wait, this was aimed at cyclists? It's only moderately helpful for bikes, but a very optimal speed for car throughput. I'm just excited that there's a suggestion for motorists to go at a more reasonable speed. I've never noticed a posted speed limit on these two streets, and it seems like the "suggestion" is having a positive effect. Many narrow streets in our city should be 18-22mph (or less, in some cases) with cyclist priority.